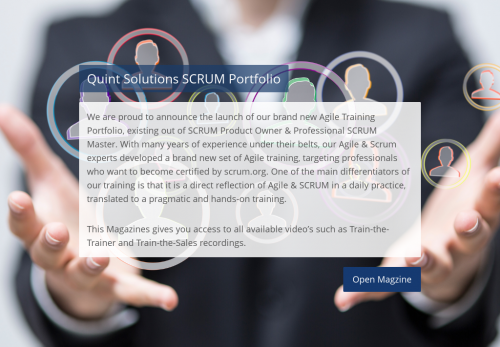 We are proud to announce the launch of our brand new Agile Training Portfolio, existing out of SCRUM Product Owner & Professional SCRUM Master. With many years of experience under their belts, our Agile & Scrum experts developed a brand new set of Agile training, targeting professionals who want to become certified by scrum.org. One of the main differentiators of our training is that it is a direct reflection of Agile & SCRUM in a daily practice, translated to a pragmatic and hands-on training. This Magazines gives you access to all available video’s such as Train-the-Trainer and Train-the-Sales recordings.